It’s not the arrow, its the Indian…..
By the early 1980s, the decline of Schlitz was accelerating. In fact, Schlitz was grasping for air as its sales were declining at a rapid rate. As previously discussed, this was due to adding an agent to the beer, chill-garde, to hide certain ingredients in Schlitz. This agent agitated the foam, created an off-taste, and, over a short period of time, the liquid was found to have flakes floating in it. In trying to stem the losses, Schlitz hired Frank Sellinger from AB in 1978. Sellinger, a chemist and master brewer, got the formula back on track and the beer was once again very good, the damage, however, had been done. Not only had the liquid changed, the brewery changed all its packaging, bottles, cans, etc., indicative of a complete overhaul. The last change was marketing the re-introduction of Schlitz. Sellinger was put on TV. His message was simple: he was at Schlitz to make the best beer! This, however, was a classic marketing blunder. Longtime Schlitz drinkers, and especially those in the Texas/Louisiana brewing pattern around Longview, Texas, where the formula was never altered, and sales were still good, started leaving the brand. These loyal drinkers had been thinking they were drinking the best beer all along and now, this guy comes on TV and said otherwise. Not long after the attached commercial aired in 1981, Schlitz was sold to The Stroh Brewing Co. The rest of the story we all know. Just early last year, a former brew master from MillerCoors, related his thoughts as to Miller’s continues sales decline. In his professional opinion, the problem is the quality of the liquid. Despite the fact that the brew master had approached senior management at Miller requesting to upgrade the quality and taste of the beer, his request was denied. The liquid never changed, but the package colors were changed! 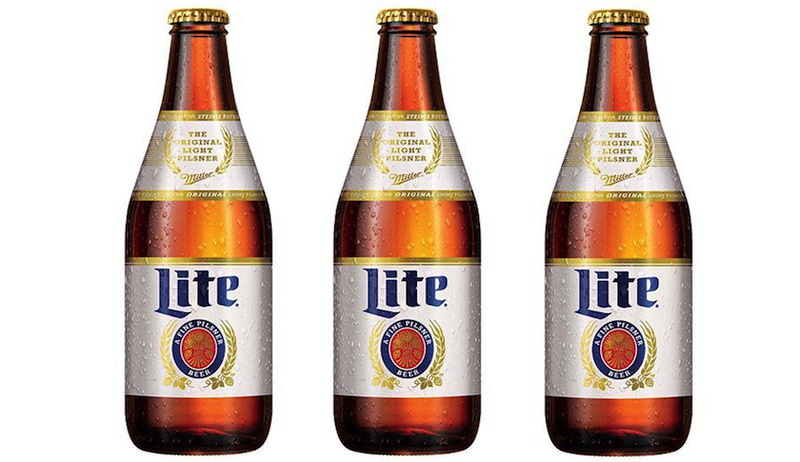 It has been a longtime since this brew master walked out of MC, and over the last five years, Miller Lite has had a different ad agency every year! The results have remained the same, with the exception of reverting back to the original colors, negative sales persist as Lite’s market share continues to slip. In reality there are many products in the market place where some might question quality or taste. Imports that struggle in some countries sell well in the US as a result of effective marketing. Then the question is: should Miller Lite improve its quality as suggested by a former brew master, or keep hiring a different agency every year? Schlitz, rightly or wrongly, acknowledged they had a problem, corrected it and communicated those changes. It did not help. Miller Lite, does not acknowledge they have a sales problem and their sales continue to drop. The consumer seems know more than the brewery gives them credit. 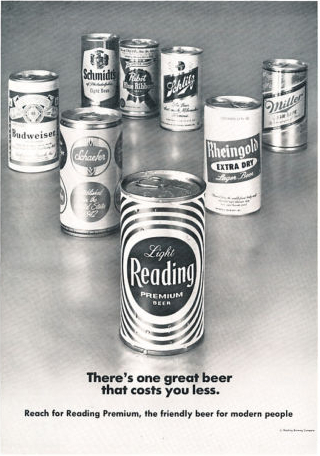 A beer can be successful with either great advertising or great quality, but ineffective advertising and poor quality will ultimately be the death of a beer. Often, it’s not the arrow, it’s the Indian…. In July of 2012, this blog wrote about the coming tsunami, highlighting the number of new beers and packages coming into the marketplace that were projected based upon that summer’s TTB new label filings. Distributors and retailers were both concerned about this massive influx of SKUs and ramped up their respective teams to figure out how to address the new model. The tsunami of 2012 continues today in 2016. The final numbers for 2015 have recently been released and others updated. Crafts, which now seem to be defined as any brewery not named ABI or MC, represent 12% of the US beer industries volume. 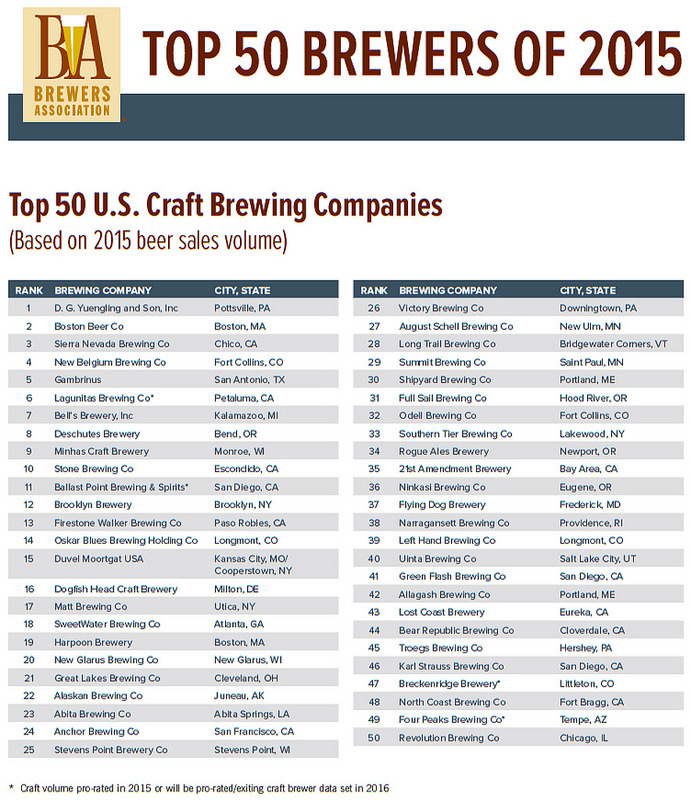 The number of crafts, as recognized by the Brewers Association, is 4,269 for 2015. 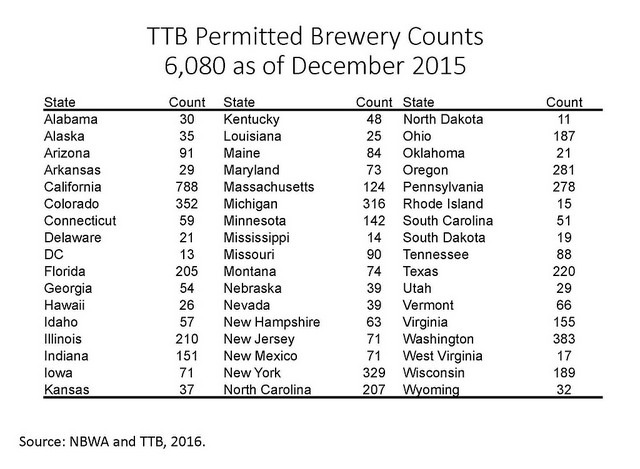 That in itself is a tsunami, however, the just recently published TTB number of operating breweries total is 4,824! This tsunami of new brewers for 2015 alone was just over 1,500 new breweries or more than four per day opening! Albeit, this is a capital-intensive business, the great majority of these new breweries are very small. It takes years to develop any scale of volume in a brewery, and without deep pockets, it can be a long, but, highly rewarding and profitable trip. In almost every case that I am questioned concerning the growth of crafts, it usually comes back to the question: “How large will crafts become in the US?” To put this into perspective, of the 4,824 operating breweries, 20 breweries constitute 84% of the total US production! That means that 4,804 breweries are playing in only 16% of the beer volume! These numbers indicate one of two things will happen: either those 20 breweries are going to lose volume; or those 4,804 breweries have to grow, and grow quickly to ultimately survive! Of course, what we are seeing is that ABI and MC, and other distributors, are buying into that 16% share by purchasing breweries. ABI alone has acquired eight breweries recently. These numbers highlight the overall issue of crafts’ difficulty in getting access to market. As we know, almost all of that 84% volume is sold thru either ABI or MC houses. There are a several smaller houses around the country that carry either Crown or Heineken that are the same size as ABI or MC, but the number is limited. Distributors must be asking, why add more brands when I already sell many of the major brands in that 16% group? Just recently a statewide distributor announced he turned down seven new vendors in one month alone! Distributors are swamped and vendors are frustrated. When Brown in Florida sold a huge part of their statewide craft/import operation many eyebrows were raised. Some pundits made the case that this was due to Brown not having the critical mass to help offset operating costs. Consider that Brown was awarded rights to these brands and they sold a portion of their craft/import business for over $50 million dollars! Brown started this model in 2009, and in just seven years flipped it making record returns while keeping some of the territory. You might say, Brown did very well. The article written in July of 2012 regarding the craft industry tsunami not only continues today, it is accelerating, and with the numbers indicated above, will continue to do so. It is the tsunami of 2016! Never let the other fellow set the agenda.. There was much anticipation by both consumers and retailers in South Texas in 1976 when Coors expanded. Coors had been available in N. Texas for about 10 years and was the largest selling brand in all those markets so it seemed it would be a slam dunk to do the same in the southern part of Texas. The largest grocery chain for beer in San Antonio at this time was not HEB it was a chain called Handy Andy. HEB soon added beer but it was still a year from doing so. Even though Schlitz was by far the #1 selling brand, Handy Andy gave Coors huge well space almost equal to what Schlitz had at that time. The roll out date finally came in late spring that year. By the time we arrived at the Handy Andy stores that first morning, the stories had already made the shelf space for Coors and was ready for the beer. Since we delivered cold product off refrigerated trucks, the beer went directly into the space. In the first store by the time I had unloaded 10 cases in the box, and returned with another 10 cases, the box was empty! The demand was so great that we could not keep the boxes full of Coors. C-stores were the same, as we were putting Coors singles in the shelf from the back, they were pulled out before we could even fill the row up! It was a beer distributors dream. That first month we worked 6 days per week delivering and merchandising accounts. It was not until several months after we introduces Coors that market share finally settled down at 13% share. Even at that number we kept up Saturday merchandising for all the major chains. It was expected by the retailer. Fast forward to today and we see that almost every beer wholesaler has a merchandising department because without one, simply put, you are in trouble. Retailers are not going to merchandise your product, especially when your competitor has merchandisers in their store. A new merchandising intelligence company, Quri, which provides consumer level data on merchandising beer across thousands of stores during holiday periods recently provided information that during the period between the times of St. Pat’s day to Easter, nationally distributed beers had out of stocks (OOS) 25% of the time! For Bud Light, Coors Light, Miller Lite, Guinness, Corona, and Stella, their on-shelf availability ranged from 77% to 92% during this time. For every 2% of out of stocks, brands of this size can expect a 1% loss in sales. In addition to these numbers, the survey reviled that more than half of these brands had no shelf price sticker. Assuming that these numbers are true, would it not seem that the ABI or MC distributor would know about all of this? Retailers would be either calling the distributor for merchandising or throwing out the distributors products. With 25% OOS, one would think both ABI and MC would know? If true, than the question is, do crafts have too much shelf space and are the cause of these OOS? Either way, if these numbers are verified and continue, expect to see some major changes in merchandising in chains. If the numbers are not represented of what is happening, Quri will have some explaining to do. No one likes to run out of product, especially beer wholesalers. Never let the other fellow set the agenda…. If we look at pricing holistically, we’ll create a more solid business. The ebb and flow of the beer industry has always been tied to the annual seasons. The summer months have typically been the season when beer flows profusely, but even during the summer months, the holiday weeks truly can make or break the year’s sales numbers. Over the decades, the beer industry parlayed non-summer holidays into big events with St. Patrick’s Day first being, followed by Cinco de Mayo, which is an important holiday for the Mexican beers. Holidays became even more important as companies were working to increase sales. Halloween now has become a big beer promotion, and more imports are taking advantage of certain key dates where a particular culture is celebrated, for example, Oktoberfest with the Germans. There is also German American Day and Veterans Day, both of which can be holiday-focused promotional sales events. And of course, the industry has typically relied on sporting events to enhance sales. The culmination of March Madness saw the usual packed bars with customers supporting their teams to win the NCAA basketball championship. Every New Year begins with the Super Bowl, definitely a high point for beer sales, and the industry laments that football season is only last half the year. Fortunately, the World Cup, which occurs every four years, is a huge volume producer for the industry. Recycling the World Cup kegs sales is no fun. Annual planning by all beer companies focuses on the above special events in addition to other events where these companies concentrate resources and dollars on getting beer to the customer. One key platform behind all their efforts is pricing. Price promotions are the one crucial element used to drive volume and consumer sampling by almost all beer vendors. Promotions are timed during the holidays when sales are at their peak. FMCG are just now starting to implement a pricing model originally used by the airlines. That model is surge pricing. Uber, too, also adopted the model. When demand for rides is at a peak, Uber will triple their rates. As we all know, airlines for years have raised their rates during peak holidays like Christmas and Thanksgiving. Conversely, airlines discount seats when there is little demand. Years ago Brazil increased prices on Coca Cola in their vending machines during their warmer months and the public expressed their dissatisfaction. Just like Americans react negatively to increased airline prices during the holidays. One wonders what the beer industry would look like if this surge pricing were adopted. What if prices were raised during the week of the 4th of July and discounted the week after? How would sales be affected? Better yet, how would surge pricing affect margins on all tiers within the industry? While surge pricing has been the pricing model for the airline industry for many years, and now perhaps other companies including Uber, it is safe to say that as long as there is competition there will be no surge pricing in beer. Unless one brewery can obtain 90%+ market share, which will not happen, beer will continue to be discounted during peak periods.